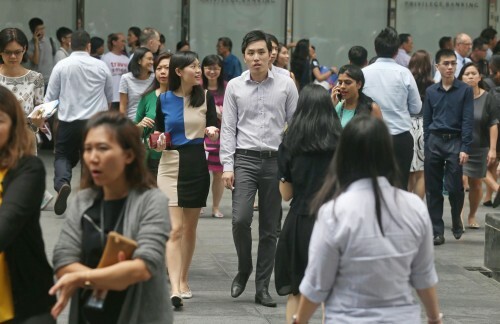 The share of job openings for professionals, managers, executives and technicians (PMETs) has risen steadily in recent years to 25,800, or close to half of total job vacancies, in 2016, the Ministry of Manpower (MOM) said on Tuesday. On September 30, 2016, there were 53,800 jobs to be filled, it said. "Amid a slower economy and on-going drive towards a manpower lean economy, the number of vacancies has been on a broad downtrend in the previous two years, barring slight quarter on quarter fluctuations,'' MOM said. Leading the list of top PMET openings were teaching and training professionals (2,100), management executives (1,210), software, web and multimedia developers (1,150) as well as commercial and marketing sales executives (940). The top ten PMET positions required at least diploma and professional qualification or minimally a degree qualification. Most required job-specific working experience. Employers tend to have less difficulty filling such posts. MOM noted that for the non-PMET openings which formed a larger proportion of hard-to-fill jobs, working conditions such as longer working hours, shift work and physically strenuous job nature continued to make these openings unattractive to locals. Among the non-PMET occupations, the highest vacancies were for service and sales workers (11,840) including shop sales assistants (2,720), security guards (2,280) and waiters (1,290). There were also vacancies in other occupations including cleaners, labourers and related workers (6,540), clerical support workers (3,160, plant and machine operators and assemblers (2,970) as well as craftsmen and related trade workers (1,910). Across sectors, the non-PMET vacancies were mainly in accommodation and food services, administrative and support services, and wholesale and retail trade, which typically had lower staff retention.